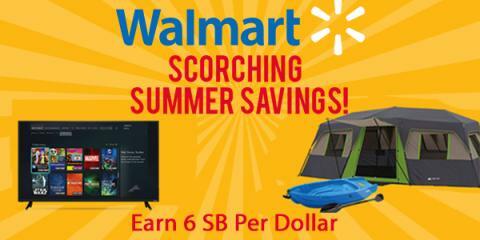 Walmart's Scorching Summer Savings - Who Said Nothing in Life is Free? Walmart is running huge deals all week long on everything from clothing and jewelry to home electronics, grills, and toys, and Swagbucks is offering 6% cash back (in the form of SB Points) for every dollar you spend through Sunday. Whatever you need this summer, now’s the time to buy it and get rewarded for doing it. Just click here to take advantage of these deals. If you haven’t signed up for Swagbucks yet, you can also do that at this page and start earning points towards your first free gift card. As a bonus, if you sign up through me a spend at least $25 shopping online through Swagbucks before the first of the month and you’ll get a 200 SB bonus – that’s $2 in addition to the points you get for each dollar you spend.